You may not know the Catalina Marketing Corporation, but odds are that you did touch their coupons the last time you checked out of the grocery store. Catalina enables manufacturers and retail brands to deliver targeted incentives and promotions to millions of consumers daily; the company maintains a database of the evolving purchase histories of more than 75 percent of U.S. shoppers, with an in-store network of over 55,000 food, drug and mass merchant locations worldwide. Their innovative approach has allowed companies to help ensure that the right consumer receives the right message, at exactly the right time. This practice generates a significantly higher response rate than traditional means of product marketing through the use of newspaper inserts. Six years ago, Catalina learned it could provide its clients with 30% higher customer response rate by using color and graphical content as compared to Black and White coupons. “By conducting a comparative analysis, we learned that color coupons improved the consumer response rate by 30 percent over the response rates for black and white prints,” said Steve Greenfield, head of R&D for Catalina. ￼So with confirmed results from testing color coupons, Catalina moved to switch 300,000 of its black and white thermal printers to full color. The increased response rate to color was great news for Catalina’s clients, but the implementation of color across their expansive network did present some challenges for the company. The black and white coupons had fixed formats and messages that had been developed many years earlier. The launch of color would create a host of new design and formatting tasks, and increased the complexity of production workflow dramatically. Deployment of color across a network of this size demanded new steps for production teams: designers now had to worry about adjusting the saturation levels of each image so the company didn’t overspend on ink; coupons had to be adjusted according to the model of color printer a store was using; the larger color files had to be optimized in new ways for fast delivery over the networks and speed of printing at checkout, and so on. In addition, as color drove higher response rates, advertisers were more interested in offering new variations of coupon content and design, so Catalina production teams were facing demand for higher volumes of asset production on a daily basis. Adobe InDesign Server: Automated production with templates. Ink Calculation Service: All production output must conform to specified parameters. Printer Service: Designers can physically inspect output as it will be printed at the stores. PreMedia Service (Claro): Provides controls for new high-resolution JPG output for new store printers. So the company needed to implement a more complex and time- consuming workflow while increasing production volume, and integrate a host of third party applications on the back end of the workflow. 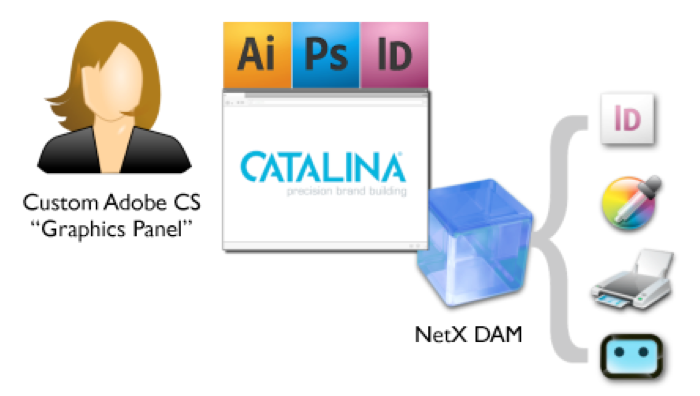 To deploy an enterprise DAM as a “System of Record” for Catalina assets, which would integrate and manage multiple 3rd party apps required for the color workflow. Centralize the designers’ interaction point with the various components deployed in this new DAM system. It became clear that the best solution would be a single “one-stop shopping” interface for Catalina’s design teams. It was proposed that instead of forcing designers to access multiple services required to create a new color asset, NetXposure could create a custom interface to the DAM but place it where the designers live all day: inside of Adobe Creative Suite. This custom Creative Suite panel could manage the entire lifecycle of the emerging color asset workflow. ￼“The Graphics Panel is a tool that allows us to better manage the more costly and complex workflow of color,” Greenfield said. The Graphics Panel operates as an Extension or Panel within the Adobe Create Suite. When a designer arrives to work at Catalina, they simply open InDesign and log into the in- app Graphics Panel. From this one panel a designer can manage their work queue, check assets in and out of the DAM, and handle all of the post processing steps required to ensure the designer is creating coupons that adhere to Catalina’s standards and quality; all without ever leaving Adobe InDesign. The Graphics Panel acts as a single interface point to all workflow components, creating a centralized production interface for Catalina’s designers. When a designer logs in, the panel knows for which country the designer will be creating assets based upon the log-in used. Each country has its own authorization, since different countries use different types of printers—some use three-color printers, while other use a four-color printer —which ensures all of the work the designer completes will be in accordance with the country that has been selected. The first step to meeting the new production schedule associated with the increasing orders was to address workflow. To streamline the designer’s workflow and deliver their assignments as efficiently as possible, NetXposure integrated Workamajig — a web-based project management software—into the Graphics Panel. The integration allows production managers to use Workamajig to assign production tasks, while designers see and interact with these tasks from within the InDesign “Graphics Panel”. Once the work order is entered into Workamajig, the Graphics Panel pulls the assignments down for the designer and automatically downloads the assets associated with the project. The Graphics Panel pings Workamajig around the clock to ensure all of the production files for each work order are ready the assigned designer when they arrive to work; there is no ￼waiting for files to download, and the designer never has to interact with Workamajig. When a designer clicks on a specific work order, all of the assets required to complete the coupon assigned are displayed in a List View in the Graphic Panel. From here, the designer can zoom in on the assets, make a contact sheet, or open them. Opening the assets will open the images directly in InDesign. NetXposure integrated with Adobe InDesign Server to allow designers to automate production with saved templates. This allows designers to send assets, along with any placed images, directly from the Graphics Panel into InDesign. When the designer is done creating the new coupon, the ink levels are then calculated to ensure the saturation levels meet the requirements for each type of printer. The panel automatically creates a version to be sent to three and four-color printers, and previews the assets for the designer in a side- by-side view. The variance of the ink calculation is computed and compared with a standard allowed variance. The standard allowed variance is a configurable field and is given as a percentage. The variance displayed is color-coded based on the deviation with the standard variance. Designers can make changes accordingly and recalculate the levels from the graphics panel, if required. The built-in Printer Service also automates adjustments to the coupons, based on what type of printer each store has. Once the ink levels have been verified and the project number has been marked complete, the Panel sends the images to Claro. The Graphics Panel has the ability to submit one or more images for the three-color printer to Claro, and receive a corresponding image for its four-color printers. Claro also generates optimized images for its three-color printers. Claro processing will fire a post-checkin Autotask job that will send all the files to Claro via web service and save the output from Claro as a view for the asset being checked in. During this process, the DAM is automating the uploading and downloading of assets, creating variations of each version. The DAM also saves the progress of each project, which equals a ton of data transfer considering each asset is touched an average of 2.3 times per designer, with a minimum of 5-6 placed images. Catalina has also branched out in its marketing endeavors, and the Graphics Panel has evolved along with the process. Designers can also make selections in the Panel to indicate whether the new asset is being created for print, web, or mobile. This selection alerts the panel to make a series of automated adjustments to the new asset. The end result of the Graphics Panel is that it takes the DAM, and all of the external services designers need to interact with it, and makes them invisible. The designer doesn’t to have multiple browser windows open, they aren’t running multiple applications; they’re simply seeing and using the Graphics Panel. The designer is also not responsible for the mundane and time consuming minor tasks, such as adjustments and uploading and downloading assets, the DAM automates much of this Workflow. By eliminating friction from the designers’ day, the Graphics Panel has allowed Catalina’s graphic artist to do what they do best—design. Catalina estimates the Graphics panel saves them more than five minutes a coupon. With the creation of huge volumes of coupons each year, the Graphics Panel has been calculated to save them the work output of roughly seven full-time designers annually.